Alrighty, so let's see.... Where to start? Yesterday I left Prague and flew back to Copenhagen and then jumped on the train 30 minutes to Lund Sweden to meet up with Kevin. Yippee! I was definitely good to see the boy again in his new university home. Lund is a lovely little town with a medieval vibe to it. We dropped my bags at his place and then headed out for some food. Being a Tuesday night things were closing earlier, but we found a pub for a pint and a burger. Then back home for sleep because this morning we took off fairly early for a road trip! Yessir, we rented a car and headed north from Lund through Göteborg and took a stretch break in Strömstad just before the Norwegian border. We grabbed a coffee and a sandwich and then got back on the road to Oslo. Getting into Oslo was a bit of a clusterpluck of course. We decided to go old school maps and our print outs for Oslo were a little lacking, but after a couple odd turns and Kevin masterfully managing the stick shift in downtown traffic, we made it to our hostel. 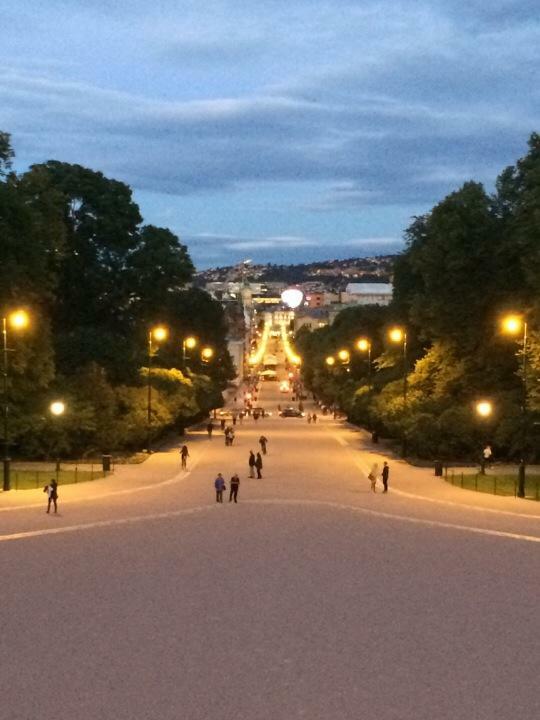 After a quick check in, we were back out on the streets wandering the Norwegian capital. Oslo is a cool mix of old and new. As one of the richest countries in the world, it definitely has some money to spend on infrastructure and it definitely feels like the whole city is under construction. Especially down on the waterfront in the opera area. But the opera itself is an amazing bus idling made of white.. marble, maybe? It was shiny and slick that's for sure. But the front of the building is a massive ramp up to the top and you can wander around up there for free and get some great views of the city. So clearly we did that. And then we wandered over to the Akershus fortress and castle and checked that out as well. Very cool. Then we paused for a falafel/kebab on the street and then kept on walking. I do believe Oslo might be one of the most expensive cities on the planet, so street food and free sites were definitely on the docket for us. So we kept on walking, saw the cathedral, city hall, wonderful fountains, parliament and the royal palace. This is a very impressive city that winds around old streets and then opens up in to expansive promenades. And dusk is the right time to be taking photos let me tell you that! But after a long day of driving and a long night of walking, we were tuckered out and returned to our hostel for a good nights sleep. Luckily Kevin remembered that Edvard Munch is Norwegian and his art would obviously be on display here, so that's our plan for tomorrow!